As we have previously reported, the modular LG VX9600 is expected to ship with a QWERTY keyboard that plugs into the main unit. What wasn't known for sure was whether or not the Versa would have a virtual QWERTY as well. If photographs spotted on Howard Forums are real, it seems that this device will have a "soft" QWERTY keyboard for use on the browser, when texting and using the note pad, and for use on other applications similar to the many uses the virtual QWERTY has on the LG Dare. Unlike the Dare's keyboard, the Versa's virtual keyboard has dedicated buttons for ".com", "@", period and comma functions. Non-letter buttons like "Clear", "Shift" and "Done" will be highlighted in different colors to stand apart from the letters. Like the Dare and the iPhone, the letters will pop up when they are pressed as a way to confirm that you have pressed the letter that you wanted. 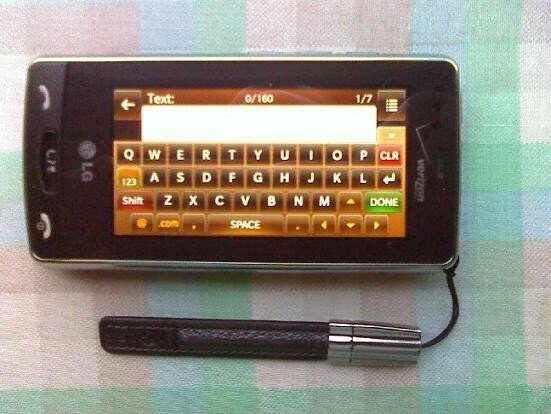 Besides the included QWERTY keyboard, the LG VX9600 is expected to offer additional plug in applications for purchase. Some of the applications expected to be available are for game playing, Wi-Fi connectivity, internet browsing, and speakers for playing music. Ooo! That keyboard looks so snazzy! It has a classic look to it instead of the generic thing other phones are doing right now. The stylus!! What a pain! The phone looks just like the AT&T Incite, just without WinMo. But really, a Stylus that can't fit within the phone is ridiculous... Oh well. Maybe that's the point of this phone: to just have a lot of "outside" accessories. Still though, seems like it would be a sweet device. And, the keyboard Does look classy. Maybe this will be the first US phone with a "zeemote" for games. I might have to look into this phone. If you do you're being dumb. All they want you to do is accessorize, just like a chick! Oh, and by the way the keyboard they are speaking about in the first sentence isn't even shown in the picture, which is the big deal of this phone, but it probably doesn't even exist yet. What a STUPID PHONE !!! Just get a Nokia N810 WiMax edition, wait til WiMax rules, then use Skype !!! Get futuristic, cavemen !